This post is for my grown son, who is learning even more foods to prepare, so he can feed himself and his friends well. Last Sunday, my son and his friends wanted to make pizza from scratch. My son asked me where I keep my recipe for pizza dough. I did the finger point to my head. Then he suggested, "you need to put this on your blog, so I can find it when your head's not available." So, here's the recipe, right where you'll be able to find it. I should say, this dough recipe is also what I use for French bread, focaccia, stromboli and calzone. I sometimes add finely chopped rosemary, oregano, thyme and/or minced garlic for added flavor. The recipe is quite basic and forgiving. You don't need to knead the dough extensively, as you do loaf bread. A few quick turns and punches in the bowl will suffice. Or you can do a quick knead in the food processor. Just pulse the dough a dozen or more times. This will make 2 large pizzas, 4 medium-size calzones, 10 individual stromboli, 2 loaves of French bread, or 1 extra-large baking sheet of focaccia. In a large mixing bowl pour water and sprinkle with yeast. Mix in 1 cup of flour and the oil. Add remaining flour, 1 cup at a time. In the last cup, the dough will become stiff. Knead right in the bowl, for about 3-4 minutes. Allow to sit for about 40 minutes. Grease your baking sheets or pans. Punch down dough. Turn onto a floured surface. Turn and punch about 20 times. Divide the dough in half, and on a floured surface, press each half into a circle about 8 inches in diameter. Continue pressing and stretching the dough on the greased baking sheet, until about 1/2 to 1 inch from the edges of the baking sheet. Allow to rise for 30 minutes, then add sauce and toppings. Bake at 40 degrees F, for 15-20 minutes (more if heavy with toppings). To crisp the bottom, slide pizza off the baking sheet with a spatula, and onto the oven rack. Continue to bake another 5 minutes, or until done. for each pizza -- in a microwaveable measuring cup or dish, stir together 1/2 cup tomato paste, 1 minced clove of garlic, 2 tablespoons minced onion, 1/2 teaspoon salt, 1/2 teaspoon each dried oregano and basil and 1/2 cup water. Microwave for 40-60 seconds. Stromboli is one of those great odds and ends meals. The other night I had some pepperoni, black olives, and pizza sauce that needed finishing off. To this I added some onions, green peppers, and cheese, for a delicious filling for stromboli to go with a pot of soup for our dinner. Stromboli has the added advantage of being a complete meal inside the bun. It's neat and tidy and makes a great take away lunch or snack. Divide dough into 10 pieces. With a rolling pin, on a floured surface, roll the dough out into a rectangle about 8 by 5 inches. Down the center, lengthwise, of the dough, spread a spoonful of pizza sauce, and sprinkle with toppings. If using any vegetables with water content, such as green peppers or onions, brown them in a skillet first, to draw out excess moisture. 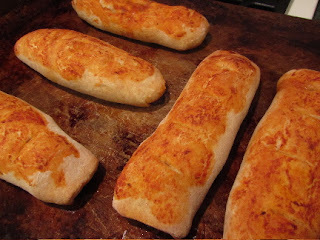 Fold the sides of the dough together, and pinch shut, forming a tube. Turn the stromboli over and transfer to a greased baking sheet. If desired, spread the tops thinly with olive oil and pizza sauce. Allow to rise for 30-40 minutes. Half way through rising, slash the tops, gently. Bake at 400 degrees F, for about 20 minutes, or until browned. These can be served as is, or with additional pizza sauce or creamy garlic sauce for dipping. Sometimes, it's not that I'd really be saving time by going out and picking up a pizza or bag of burgers and fries. Afterall, by the time I get in the car, drive out, wait for an order, then drive back home, it's been at least a half an hour. So I think getting take-out is more a need to be waited on or taken care of. Our lives are so hectic, we rush from here to there, pick up/drop off, take orders from the boss, give orders to our children, clean up, tidy up, spit, sparkle and shine--life is exhausting. And we just want someone else to do something for us, for a change. The fast food industry has built their model on this modern day need. There is another way. It's not that I want to put McDonalds and Pizza Hut out of business. I just think that if I recognize this need, then maybe I'll look inward to fill it, rather than spend more money (on fast food), just so I can work harder, so that I can pay for it all. Interesting philosophy on why fast food is so popular. I'm going to have to think about that for awhile. Off the top of my head, I think it's more of an instant gratification thing in some cases rather than feeling a deep need to be pampered. However, if we're to dig deep, I think everything is intertwined. I think instant gratification plays a part. Our culture has lost it's sense of patience. Many have gone into debt because they want whatever, and they want it now. It's tempting. You see your neighbor with the latest and greatest whatever, and you feel that you should be able to have the same. What we may not know, is neighbor may have gone into debt to obtain that latest and greatest. But for me, having someone do something for me is high on my list. That's part of what I love about vacations. The maid cleans the room and makes my bed. The waiter brings me my meal, and the kitchen staff cooks and cleans up for me. A doorman opens a door for me. I like having someone else do everything for a few days each year. But this is something that I'm working on. I don't know why that is something you have to work on. It is nice to have someone take care of you. You should enjoy the chance you have to experience it occasionally. You deserve it. First of all, there are people who work far harder than I do, and are much more deserving of a few days of luxury than I am, yet they get none. I suppose I feel a bit of guilt over that, even though it's not something I can control. But what I think I meant was, perhaps my attitude is off-kilter a bit. Instead of doing the mental grumble when I'm the last one in the kitchen every night cleaning up the dinner mess, I should a) be thankful I have food to have a mess from, and b) I should just ask family members to help out more. I'm not terribly good at asking, until I get to that breaking point, and then I sound very demanding and unpleasant. If I just ask up front, for help, I won't feel so much like I'm doing the work alone. And that is what I'm working on. Oh, that is a good thing to be working on-asking for help sooner. You have a very loving family and I'm sure that they would be happy to help more. They just don't know that you want it. Sometimes, I get upset for the same reasons, and we have a family meeting when I'm not upset and I tell them how I feel. We then come up with a solution that will work for everyone. That works until something else comes up or we slip into our old ways. Then we try again. Yummm! 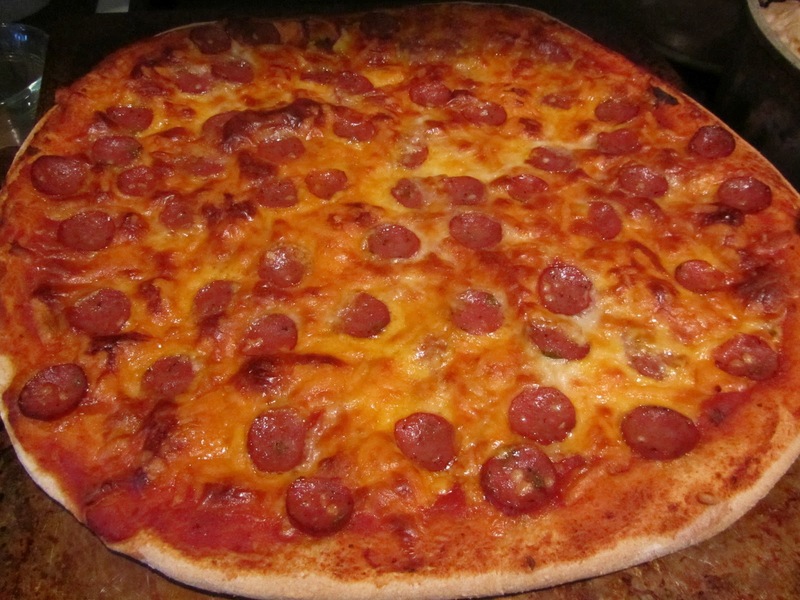 I love homemade pizza and thankfully, so does my family! ours, too! I'm also really having fun with stromboli these days. Like pizza, but I can sneak more stuff inside than if it's out in the open on a pizza. I like your thoughts on recognizing the need to have someone else do something for us for a change. That is a very good point. And your pizza looks delicious! We love pizza here. you of all people, right now, must know what it feels like to be serving everyone else a good deal of the time. I hope you are taking some time for yourself, maybe just in little snippets, but those breaks can help. Who ever invented pizza deserves some sort of special recognition. It seems to be universally loved! I also think that it isn't always the cooking that makes us feel overwhelmed, it's the cleanup. Having someone else deal with the mess is the most appealing aspect for me. definitely! Cleanup is almost worse than preparation. The good part's over. 'What's the incentive to stick around and help clean?" seems to be the thinking. Our house is an older home, and when it was finally time to do something about the decrepit kitchen (read really bad, hole in the floor under the dishwasher, 1 foot diameter and growing), we built in a few work-saving things into the remodel, just to make cleanup easier. But even so, the stove top always needs wiping down, as do the counters, and the floor needs sweeping. But that's what they pay me the big bucks for! Ha ha!